Featuring the flora and fauna that is the bounty of Mother Nature, “The nest” is a celebration of the harvest as well as renewal of spring. Above, two birds feather their nest, which is filled with eggs. The tree not only offers them protection, but a source for nesting materials as well. The overflowing harvest appears below. Corn, melons, grapes, pears and apples spring forth in a cornucopia of fresh vegetables and fruits. 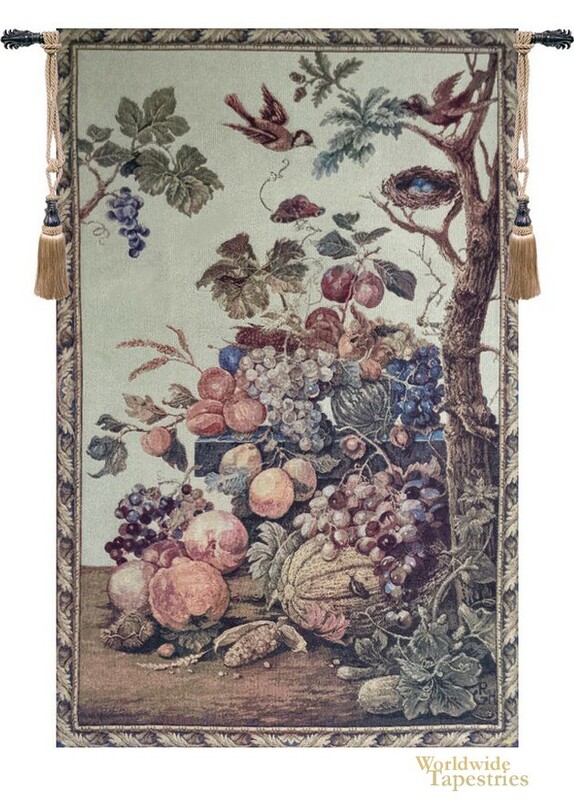 Delightful in its composition, the tapestry itself has an overall beige color, allowing the colors of the flora and fauna to jump out from the rest of the tapestry. This tapestry is lined and has a tunnel for easy hanging. Note: tapestry rod and tassels, where pictured, are purchased separately. Dimensions: W 26" x H 40"